Our mission is to provide every child with a caring and positive atmosphere to learn and grow. We treat each child as an individual who learns in his or her own way. As we bridge the gap between home and school, we guide children to a continued positive self-image while building social skills in a school setting and fostering the joy of learning. Robin's Nest is the only daycare in the area to give parents the ability to watch their children online for added peace of mind and a connection to their child while with us. It's time to plan for this years summer camp - “Building Tomorrow's Future” Click the button below to download the 2019 Summer Camp Reservation Form. Space is limited. Don't miss out. See Robins Nest Learning Center rates as well as helpful information about requirements, age restrictions and what will be needed for your child to attend our facility. Proud winner of the 2014 “Association for Early Learning Leaders” Director of the year! Click here to Download 2019 Summer Camp Reservation form. Gold Circle of Excellence winner! 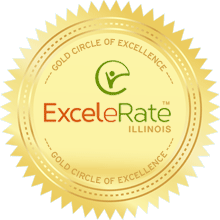 Robins Nest Learning center received the Gold Circle of Excellence from Excelerate Illinois; a system that rates early childcare programs based on research in child development. This is a great honor as the The Gold Circle of Quality recognizes programs that meet or go beyond the highest quality goals. Gold Circle programs have met the highest quality standards in three areas: learning environment and teaching quality; administrative standards; and staff training and education. Programs are actively engaged in continuous quality improvement. You can learn more about Excellerate Illinois on their website or click here to view our article in the Southern Illinoisian. Join Robins Nest Learning Center on Facebook to stay current with school information, special events and more! Plus, we post lots of pictures of our little ones learning and having fun. Click the link below to find and like Robins Nest Learning Center on Facebook. Our mission is to provide every child with a caring and positive atmosphere in which to learn and grow. We treat each child as an individual who learns in his or her own way. We realize that it is our job to find out the best way each individual child learns and to work as a team with the family of the child in order to ensure the best possible learning environment. As we bridge the gap between home and school, we guide children to a continued positive self-image while building social skills in a school setting and fostering the joy of learning. We firmly believe that children learn best in a stimulating, energetic atmosphere, with hands on activities, teacher guided lesson themes and repetition. We use our classroom as a model to teach respect, manners and team work. The staff at Robin's Nest engage in open ended questions, positive redirection, modeling behavior and working hand in hand. Robin's Nest organizes many special events and excursions for parents to get involved with. accredited through NACCP, Qualistar & Child Care & Resource! Copyright Robins Nest Learning Center. All rights reserved.